​"I empower mid-life men and women to make the choice to live as actively and as independently as they can, for as long as they can​" - Walter Adamson. I made the choice myself, when I was 50. Now, 20+ years later, I'm (much) stronger, lighter, healthier, more energetic, more flexible and have better posture and balance than when I was 50. I have more muscle mass and better bone density, and my superior muscular-skeletal condition means that my joints have less load and few aches and pains. Being in good physical condition makes me feel good about myself in every other way. There is no secret in WHAT you have to do - you just have to lower your body age. The secret is in HOW to do it, and HOW TO SUSTAIN it. I've been sustaining it for 20 years now, and my body age is generally 15 to 17 years less than my physical age. I believe that this gives me the best possible chance of living longer than those who don't reduce their body age. And, the years I live will be more active and enjoyable. Over 20 years of doing it I've learnt that the biggest factors in fitness over 50 are not what you'll get from your personal trainer, or even from Google. I've learnt what works and put it into practice. And just as a bonus I have a Professional Diploma (Associate Degree) in Sports and Exercise Nutrition. Have the desire but don’t know how to start? When I started exercising in 2000, after being diagnosed with Type 2 diabetes, I floundered about for 4 or 5 years. I gradually learnt how to be much more structured and much more focused on what is really important for people over 50. I realised how important progression and intensity are, along with neurological impact, and from that I developed my unique 7 Levels Of Fitness guide. ​Going to gym but not making progess? I see many people over 50 who have been going to gym for 5 or 6 years, and have stopped making progress a long time ago. It disappoints me that they have stagnated because they are investing time and effort, but for diminishing results. Not only that, some of the routine things they do are potentially creating long-term problems. I'll save you a lot of wasted time, and get better life-changing results. Keep being distracted and giving up? It takes persistence to keep exercising and eating well. And at times, distractions can lead you astray. Creating the right expectations, understanding the choices you are making, and being able to check-in for support are all important pillars of your success in transforming your "fitness for life". I'll be your accountability coach and keep you on track. Health is the foundation of fitness and a healthy life. I have found unbridled success in using a highly nutritious healthy weight-loss 90-day weight loss program to kick start active participation in exercise. By integrating nourishing solutions into your everyday life the release of new energy and vitality, along the with new feeling of confidence, my clients literally WANT to start exercising whereas before they used to lack the energy to even think about going to workouts. ​Changing your habits is a discipline in itself, and while some people can say on the path most get distracted by various triggers which push them off-track. It could be the people that surround you, or it could be your own inability to sustain the necessary consistency without help. Habit changing requires a firm belief that you can actually change, and self-doubts can creep in during the ups and downs and plateaus. Every bit of the program can be challenging. I work with you to clarify your motives, your attitude towards motivation and your most sustainable exercise program. If you cannot get up from a chair without using your hands (fold your arms across your chest and stand up) then you're not going to be able to continue to get up off the toilet or get out of bed or into a car. That means you will be forced to give up your independent living - "aging in place". You can change this, by the exercise choices you make, and potentially live 5 to 10 years longer independently in your own home. Not only that but there is a strong correlation between an active body and a healthy mind both physically and functionally. Maintaining physical activity gives you the best chance of prolonging your mental capacity and functioning. I work with individuals, brands, organisations and owners to improve their ability to understand and implement the full potential of healthy ageing. "You're not old until you're 100" is a philosophy which guides my personal actions. My advice is not just about fitness, it is about creating strength, endurance, stability, mobility and mental activation. I help my clients achieve positive, lasting change in the behaviour that they choose, and to feel good about themselves. Message me. ​I provide expert experiential advice on exercise, ageing and business opportunities to brands and organisations targeting this over 50s audience. I am part of the Baby Boomer cohort who is today underserved in practical advice and support for lifestyle fitness, preventative nutrition and exercise, and "living in place". ​I help individuals build their capacity to make lifestyle choices which reshape their self-belief and their imagined future-self. I do this through Accountability Coaching which is focused on the self-recognition of triggers, and the ability to develop their own self-capacity for sustainability. I help them apply this "sustainability resilience" to their health choices, fitness choices and life choices. ​I speak to groups about the fundamentals of the life and lifestyle choices that are theirs to make - cancer, separation, confidence, exercise, sustaining hope, and how to give out what you want to get back. Also, of course, I offer myself as the example of how to keep fit for life at 70 - beyond your imagination. I help them see themselves in me. I help them understand that everything that desire or are seeking from beyond is already within them now. 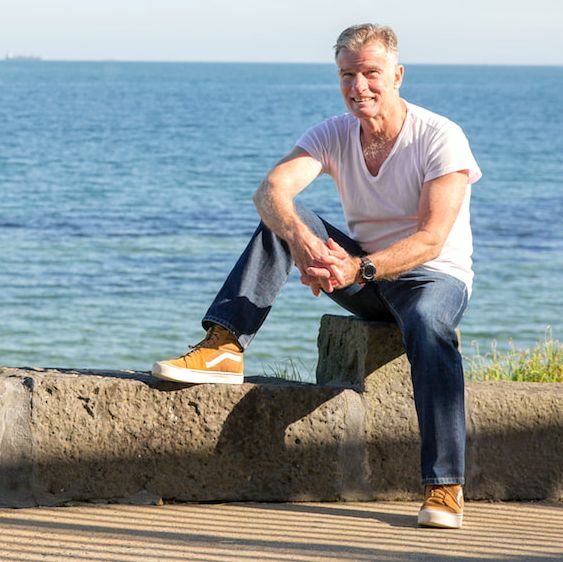 ​I work with health and allied professionals to help them convey to their clients the real potential and the real benefits of keeping fit over 50 and into the 80s - with me as the example. This often occurs in the setting of groups. I provide myself as an example in order to motivate their clients, and I discuss my journey over 20 years through diabetes, cancer (twice), and separation, and give them practical examples of the choices I made, and why, and what it could mean for them. ​For qualified and ethical brands I am a potential brand ambassador being the "living proof" of healthy ageing, along with stories which relate and a strong posture and presence. I'm not a celebrity but I am "just like them", and they can relate. And I have been through many of their experiences in life and in health and fitness. I can reach and convert the Baby Boomers and the over 50 audience. ​I can provide quality content to a brief and deadline on topics related to "healthy living over 50". This would be based upon my own experience and results, on curated research, and where applicable, using my qualifications in sports and exercise nutrition. Typically a written piece would be between 400 and 1600 words and require one to three weeks to produce. My most powerful content refers to results that I have achieved, and why this would be beneficial for others. I walk on the beach, run on the bush tracks, train at gym, and eat well at home. Variety and effort contribute to body age reduction and better body composition. I'm not doing this for the "body beautiful" but for body age reduction. A better looking body is a side-effect of that. I consider that what I do is not ego-based training but soul-based training, and I can help you make that mental shift also. Running up the grassy hill builds stamina via interval training. Actively warming up is essential, and running modest distances - up to 5km - a couple of times a week builds conditioning, and balance.